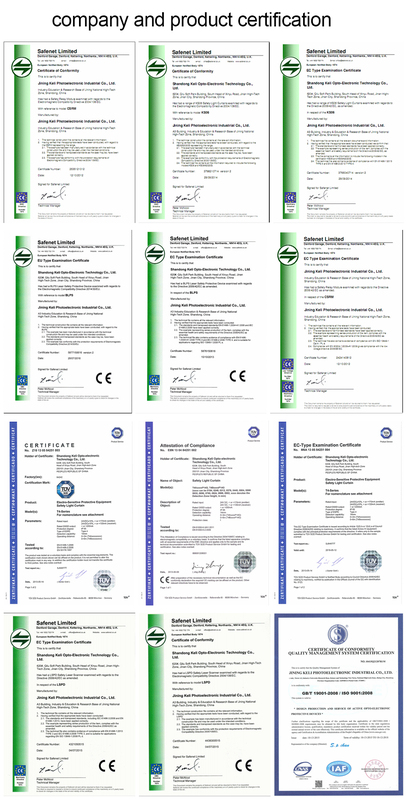 Applied for expanding safety output contacts. compact structure, high reliability and performance/price ratio. Shorts across the input contacts are detected. 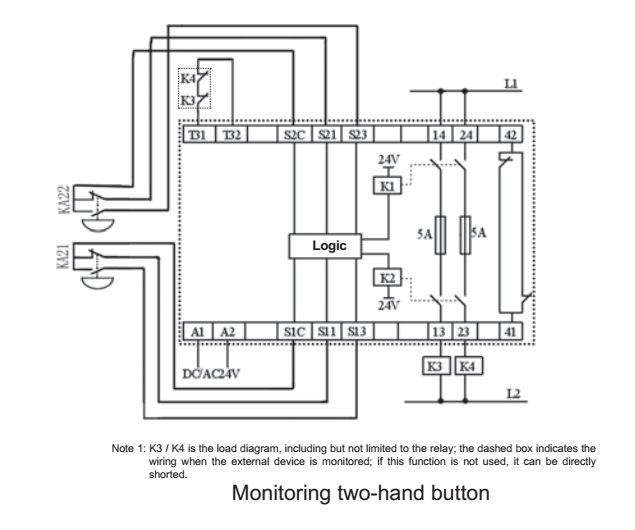 It has self monitored redundancy circuit. It has status indicators, It has removable terminals. 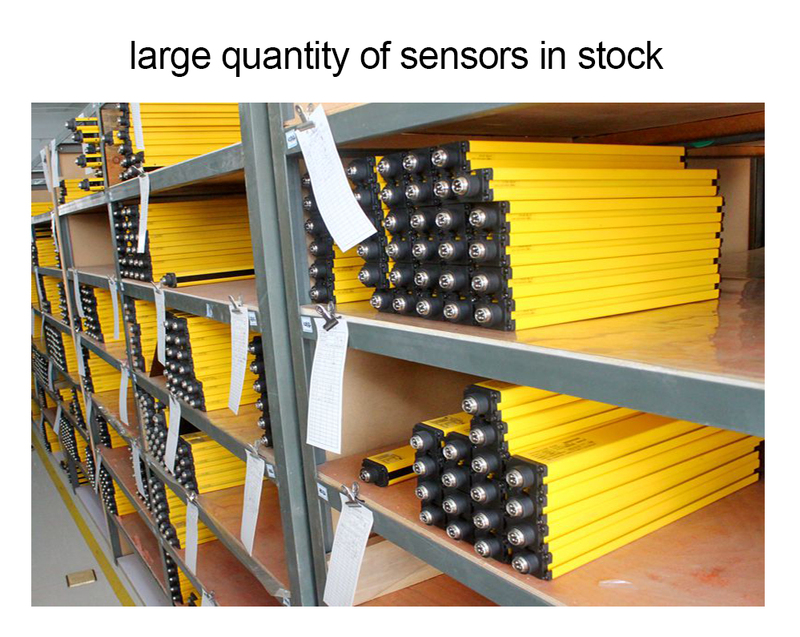 And we have large quantities of terminal , component parts sold to mildest area, India, Southeast Asia, Africa every year. If you have requirement and question, please feel free to contact us. 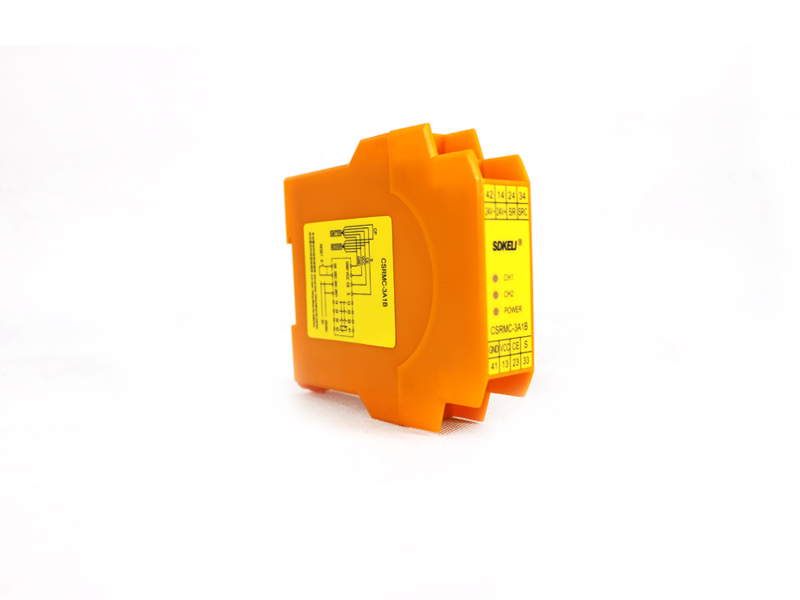 The relay contacts are positively guided, to monitor more effectively and more safety. The CSRM has smaller external dimensions, be connected with plug-in terminals for easy installation. 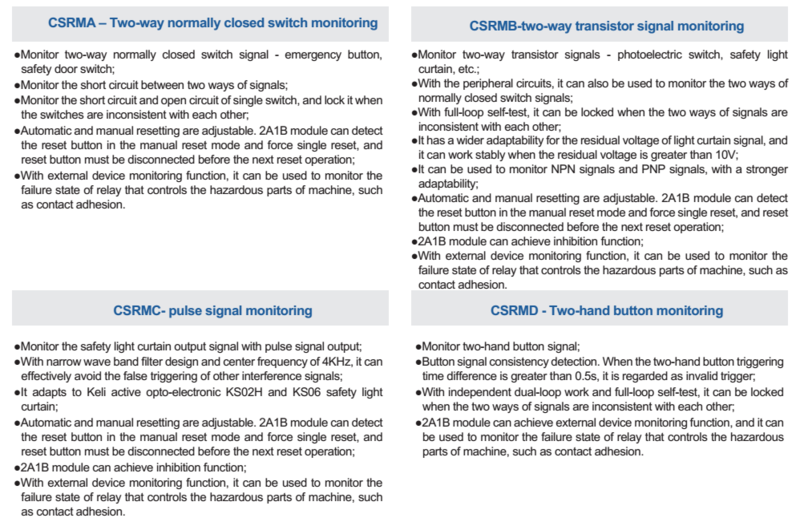 CSRM has 3NO and 1NC control output signal with higher control ability. Monitor short circuit between two ways of signals. 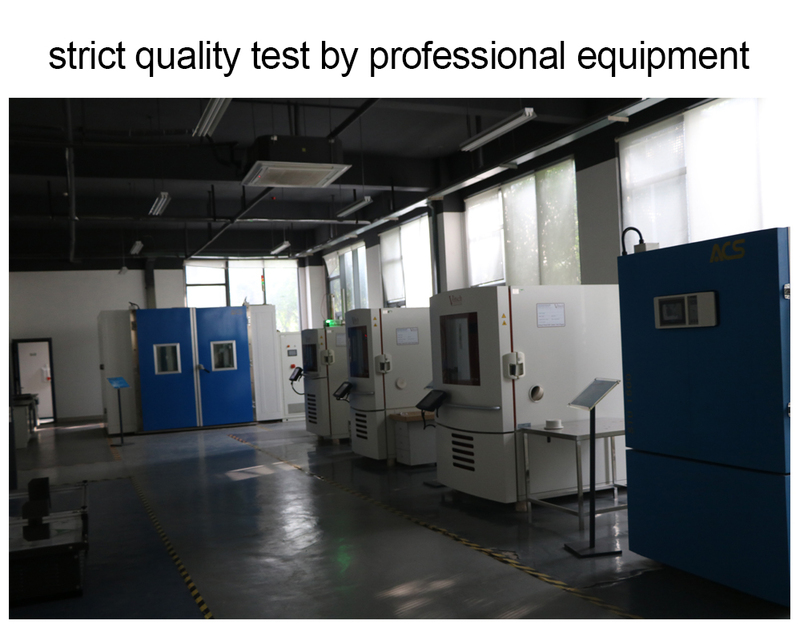 With external device monitoring function, it can be used to monitor the failure state of relay that conrtrols the hazardous parts of machine, such as contact adhesion. Monitor 2-channel PNP signals or NPN signals, such as optoelectronic switch, Safety Light Curtain etc. Monitor 2-channel NC switches coordinating with the peripheral circuits. Self-tested by full-circuit and locks out while the two signals is inconformity each other. Work normally when the residual voltage is more than 10V with a wider range of adaptability to transistors. Auto-reset and manual-reset can be provided. At manual reset, the reset button can be tested, and signal reset is mandatory named as the next reset can be operated only after opening the reset button. 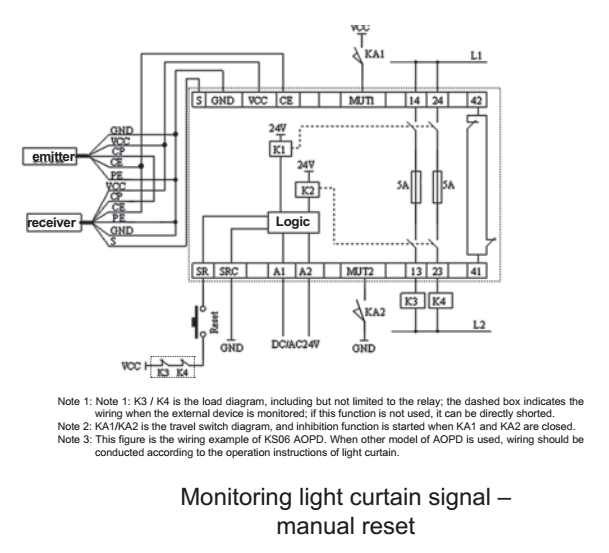 Monitor safety light curtains with pulse output signals. by other interference signals effectively. Applicable to all types of light curtains of SDKELI. reset is mandatory named as the next reset can be operated only after opening the reset button. The consistency of the signals can be detected.While the triggering time of the signals exceeds 0.5 s, it is considered as invalid triggering. The module works with two loops, and self-tested by full circuit.It locks out while the two signals is inconformity with each other. 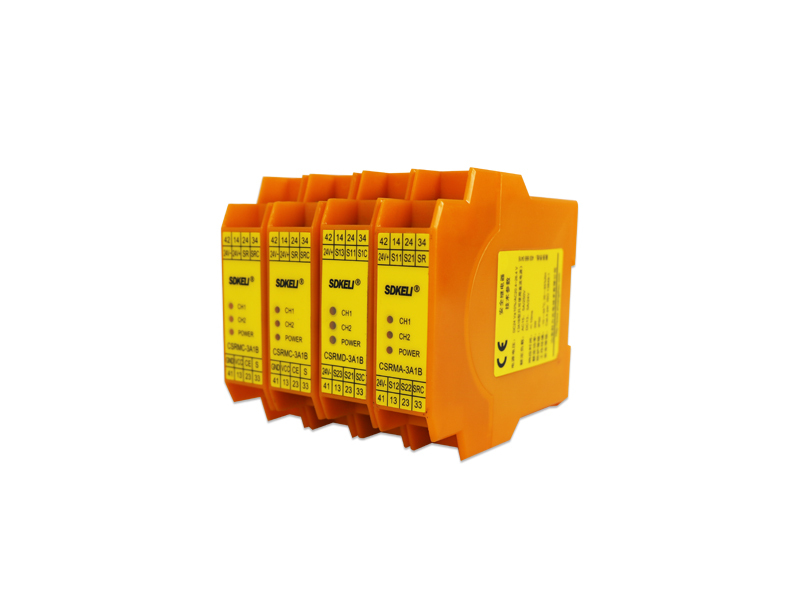 Looking for ideal E-stop Safety Relay Manufacturer & supplier ? We have a wide selection at great prices to help you get creative. 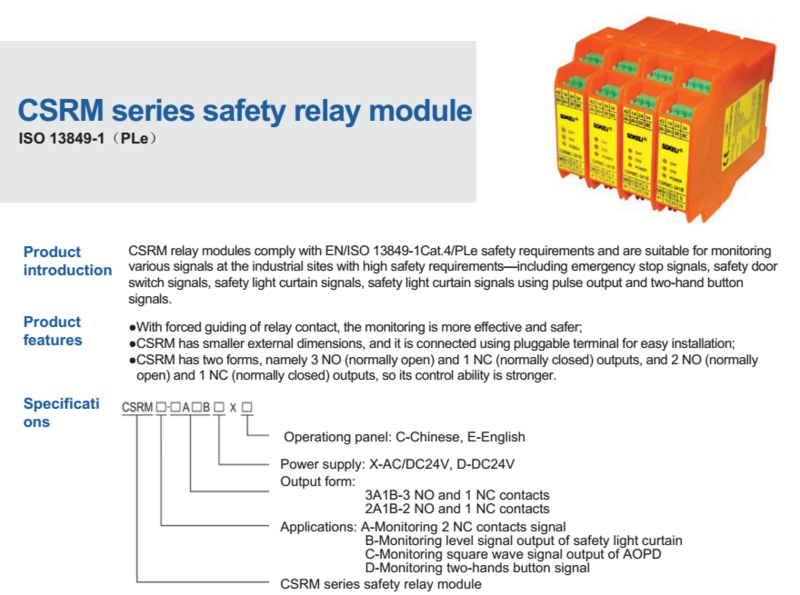 All the Safey Relay Module are quality guaranteed. We are China Origin Factory of Two Hands Button Relay. If you have any question, please feel free to contact us.